Achieving the perfect lawn is no small feat. However, if you simply employ some minor lawn care practices including but not limited to: regular mowing, fertilization, and watering, your lawn will be the best on the block in no time. One of the most important steps in perfecting your lawn is to make sure you are keeping it aerated. Aerating your lawn involves puncturing small holes in the soil to allow air, water, and fertilizer to infiltrate the roots which will, in turn, allow your grass to grow better, stronger, and faster. Those with compacted soil especially need to aerate their lawns, as the heavy debris can cause your grass to miss out on the nutrients it needs to survive. Heavily trafficked lawns should be aerated twice a year, once in the spring and once in the fall. However, most lawns can be aerated just once a year for optimum health. In this case, it is best to aerate your lawn during the cooler growing season so the grass can heal itself from the holes made. It is important to note that newly laid sod should be allowed to rest for 6-12 months before you begin the aerating process. 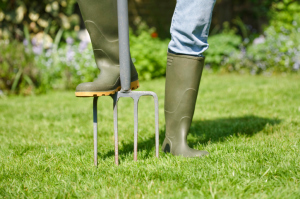 After aerating, water your lawn to allow the water direct access to your roots. You should then assess your lawn’s needs and fertilize and seed as needed. Although aerating alone will not fix all of your lawn care problems, it is the first step to tackling the issues from the root up. It usually takes approximately two weeks for the cores to disappear. Regular mowing may help speed up the process, but be sure not to rake or pick the cores up as it will hinder the process. Aerating is an important part of the lawn care process, but luckily you don’t have to go it alone. Entrust your lawn with the professionals at Greener Horizons and have the perfect lawn every time! Using specialized quality control systems, we are able to help ensure our customers throughout the Massachusetts and Rhode Island regions have their needs and expectations continually met. Contact us to get started on maintaining a beautiful lawn.